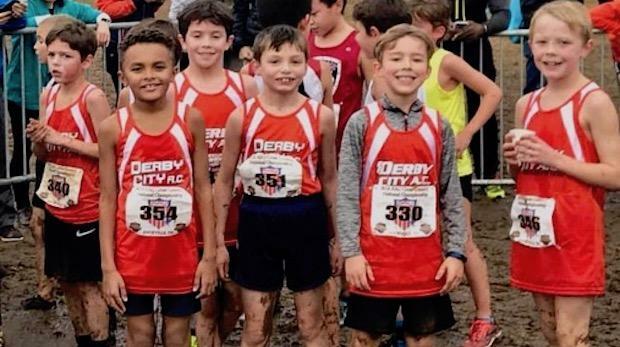 The Derby City Athletic Club cemented its position as one of the nations's premier youth distance running clubs with a victory in the AAU National Cross Country Championship at the very muddy Victor Ashe Park in Knoxville, TN. Vying with approximately 130 clubs from the US, Bermuda, Canada and Puerto Rico, Derby City earned its fifth AAU national title. NYC's Prospect Park Youth Club took the runner-up spot. The Derby City win was truly a team effort with Top Three finishes in six of the ten divisions. DCAC's 7-8 year old boys were the stars of the day as they not only won the division national championship but scored a perfect 15 points after individuals were removed. This age group was led by Derby City's highest individual finisher of the meet as well - Gannon Parke from Beechwood Elementary - who finished 3rd. Other Kentucky youth clubs also competed in the AAU meet. The Louisville Tigersharks won the team title in the 9-10 boys division. Claire Reburn of the Northeast Striders claimed the individual national title among all nine year old girls.